A full-featured MongoDB sample covering embedded array functionality, written from the CRUD point-of-view, may be found here. Mongo is nicely accessed via Morphia, a sort-of object-relational manager (ORM) that is very lightweight, for Mongo doesn't need much of this. Some stuff is from me, from the course I took from 10-gen, from synthesizing [email protected] or from ripping off voices like Scott Hernandez, Jenna Deboisblanc and others directly. What are tables in relational databases are called "collections" in MongoDB. What are rows in relational databases tables are called "documents" in MongoDB. Lost? Want to say something like describe table? Use findOne(). It will show you a random document in the collection. To pretty-print a JSON, append forEach( printjson ) to a query statement. Logging statements are piped to stdout by default. For more verbose logging launch dæmon with increasing numbers of vs (mongod -vvvvv). There is a configuration file that's very desirable for real Mongo use. It's well worth looking into. The best help, however, is http://www.mongodb.org, use the Search engine. storageSize is the amount of space allocated to the collection, which is not the size or number of files in the system. Size refers to the size of the collection. Neither of the two includes index size. The data size is not related to the number of chunks. The compact() command does not reduce the disk space of the collection, but rather defragments and condenses the data on disk. There is a ReST interface to MongoDB that can be turned on when launching via the --rest option. For example, to get a list of collections, the URL is http://127.0.0.1:28017/test/system/namespaces/. How may databases should be created? In MongoDB version 2.2 (the next stable release) there is database-level locking (currently there's a global write lock), which may be a reason to create multiple databases. How many shards should be created? This question depends upon use cases and specific system metrics are necessary to provide specific advice. You need to consider expected write volume as well as data size. If your data fits in RAM, you'll be able to handle more inserts per second than if you're forced to go to disk. It's probably a good idea to limit the data on a single node to 70% of available disk space (filling the disk to 100% should be avoided at all costs). The concept of configuration server in MongooDB relates to sharding only and is several special mongod instances that maintain the sharded cluster metadata in a configuration database. A sharded cluster operates with a group of three configuration servers using a two-phease commit process to ensure immediate consistency and reliability. (These mongod processes have nothing to do with replication, replica sets or replica nodes.) See more about this here. For sharding, see here and here. How many replicas should be maintained? Three nodes per a replica set is recommended for data durability. If you expect a high number of reads (much greater than writes), additional replicas will help to spread the load. Additional replica members will increase fault tolerance, which may be important for your application. In addition, you may find it beneficial to have a single replica lag behind the rest as a way to jump back in time (if, for example, a bug in your application corrupts the data on your primary). The recommended minimum of three is comprised of two full and one arbiter, or three full nodes. Break up data across multiple databases in MongoDB? Breaking up your data into separate databases makes the data more portable, makes it easier to store the data on separate disks, and gives you the option of specifying different authentication schemes or backup strategies. In MongoDB 2.2 (the next stable release), write locks are distributed by database rather than a global lock, which will improve concurrency. Breaking your data into separate clusters affords the same or more flexibility, but there's an overhead associated with creating a new cluster. Each cluster should have its own replica set for data redundancy. One-to-many relationships may be good to embed. If the possible list of entries embedded is unbounded and large (thousands) then linking to documents in a separate collection might be better (i.e. : _ids from collection "accounts" might be used in collection "adresses" to bind address documents to accounts). Benchmark a few different variants to see what performs best in your case. Limiting the database size. If this is important, try the trick outlined here: http://souptonuts.sourceforge.net/quota_tutorial.html. It's possible to design one's schema using embedded documents, non-embedded (i.e. : separate documents) or a bucket (hybrid) structure. There's an excellent and short post about this here. Help mapping from SQL, there is an SQL to Mongo Mapping Chart. Solution to getting MongoDB logging to come into our log files. This can be had if using Slf4j. See http://stackoverflow.com/questions/869945/how-to-send-java-util-logging-to-log4j. To reach MongoDB via HTML, add 1000 to the port on which it's running. If your local host is running Mongo, use http://localhost:28017. Some links require the ReST service to run, accomplish this by launching with --rest. Commercial, inter-node SSL support for MongoDB is had at 10gen Customer Downloads and the price for this, very steep, can be seen in the "Enterprise" column here. MongoDB basics for everyone! (a six-part series, pretty good). Vimeo presentation on Mongo Java driver. MongoDB Gotchas & How to Avoid Them. Java Development with MongoDB, a good slide presentation. Super article on MongoDB replica lag: MongoDB: Replication Lag and the Facts of Life. When you install MongoDB using the Debian package, it establishes itself as a service via Upstart which isn't what you want if you're running the local installation as a replica. Whatever the reason for your interest in this matter, note that the script that governs the Upstart nature of MongoDB is /etc/init/mongodb.conf, not to be confused with /etc/mongodb.conf, what's used to configure how MongoDB starts (not that it starts at all and is stoppable, etc. which is what the Upstart configuration file does). A good link discussing this is ubuntu: start(upstart) second instance of mongodb. "fax" : "33 (0) 3.29.90.66.63"
...or locate stuff that might be in the database. See field (i.e. : column in SQL) particulars only for query results. This abbreviates the document returned to only those fields that are to be used. This is vaguely reminiscent of SQL JOIN. See list of query operators. Find Bea's document (record) and add in her last name. Then, find and display the whole document. "password" : "don't hurt me"
See list of update operators. Remove a document from the collection. The empty command prompt caret shows Mongo's answer to a failed query (nothing). MongoDB queries are clever in that they are more or less "query by example". Upsert means to create a document where none existed to be updated (or merely update as instructed). multiupdates are updates fired on all documents that match the query. After using a database, here's how to drop a) the database, b) a collection, c) a document (DELETE FROM Account WHERE...). Indexing is a way to improve performance when data are well known. When encountering performance issues, poorly designed indices are usually to blame. Look at the output from explain(). There are multikey indices for fields containing arrays; each entry in the array appearing in the index, and compound indices where two fields are indexed on. Often, to get the best performance, a compound index is desirable, e.g. : querying the list of a user's tweets sorted by creation date. This is sort of thrown together, simplistic and tentative. I may come back to do something a little better. Download the MongoDB Java driver and Javadoc JARs from here. Adjust the version as necessary. The current Java driver (Javadoc) documentation is usually found at: http://api.mongodb.org/java/current/. The notes earlier were all console work; the Java driver is available of course. This code assumes that database we were playing with. How to embed $or, etc. in queries. Here, we're looking for a document in which a is either 10 or 5. First, we create the factors with values 10 and 5. Then, we create an operation that will OR them. We get a query ready. Next, we add the factors one at a time to the OR operation. Then, we tuck them into the query. // as many times as we get here, 'found' is a document that matches! When sorting out ObjectIds, between String and ObjectId, try the following. The point is that if you don't know if the thing coming in is a string or an oid, this helper will ensure it's what Mongo wants (_id, etc.). Since JSON makes copious use of double-quoting and one sees double-quotes all over the place, it's easy to get lulled into looking in the wrong place for a failed query. For example, let's say you're representing some object type as an integer, but it shows up in some method as a string (for whatever reason), you may not notice that you have to pass it to BasicDBObject.put() as an Integer when stepping through the debugger. What's done in a JOIN in SQL might be done in the same document in MongoDB since the schema is so fluid. Here are various renderings of addresses in a user account. This is probably what I'd prefer since I like to tout an addresstype. This works only if our interface makes use of strings such as "homeaddresses", "shippingaddresses", etc. It's nicer to look at in the Mongo console, but presents maybe no other benefit since users won't have gazillions of addresses anyway. Here's some exploring of update. I used additional vertical space to make things clearer. The two updates done here do different things. When $set is used, it adds the new construct to what's there. When not, it replaces all, but the _id. Here'a rather more complex exploration with interleaved Java code (that, at first at least, wasn't tested even for syntax). // Initialize 'sam' with the bucket that interests us. // sam "points" at his account! // this will replace what's sam with what's address: we don't want that! // Now, when we look at all we've got, we see different stuff in one bucket than in another. I have project named TryIt in which I prototype things quickly if I wish to experiment. Here's a class in it. It might be referenced from other notes on this page. The Java snippet above created the Mongo console experience below. A (Java-shabby) array is created for the purpose of demonstrating wild arrays embedded in a Mongo document. A Mongo document is created and the array embedded as odd-array before being inserted into the database collection shown. That is, a complex object array. The $ (dollar sign) can be used to represent the position of the matched array item in the query, or first half of an update operation. You wish to re-type the second of the two addresses from 3 to 2. First, create a query that will identify that address. With the right address getting isolated, you can now use the positional operator to set its type field to 2. That did it. You can now reuse the query to determine that it actually happened. In Java, some of this above would be like this. Just as above, notice the dots and dollar signs. Incidentally, if only one of these fields, say street, were to change, the others just wouldn't be passed (as is obvious from checking to see if something's in there in the first place). Here is some semantic fall-out from MongoDB terminology and things we say about MongoDB. Sharding —Where data is split between more than one replica set. What is in one shard isn't in another. Sharding in MongoDB must be carefully configured, it doesn't come for free, you must do a lot of extra work to achieve it. Among other reasons to shard, sharding can be used to solve issues of geographic collation of data and scaling of that data. MongoDB configuration server —This is a special instance of the mongod dæmon that maintains shared-cluster metadata to give to instances of mongos. It's the "how-to" section of the sharding mongos brain. There should be three of these since the MongoDB is dead in the water without at least one in good health. A configuration server (also called a "config server") can only mean sharding. Replica set —A collection of replica nodes. A MongoDB shard must have one of these, but a replica set doesn't need to be in a shard to stand on its own. A replica set ensures that data is written to more than one node (place)—effectively duplicating it or better. Note that as soon as you say multiple replica sets, you are necessarily referring to a sharded configuration. Replica node —A single instance of the mongod dæmon running usually alone on a VM or host. mongod —This is the basic MongoDB dæmon. In a sense, it just i MongoDB. mongos —This is a special dæmon that connects an application to a MongoDB sharding set-up and controls reading and writing to the appropriate shard for the data concerned. It uses information from a special mongod erected as a MongoDB configuration server. mongos can only mean sharding. See http://www.littlelostmanuals.com/2011/11/overview-of-basic-mongodb-java-write.html. Explore also "MongoDB tagging." A better much later treatment exists as a subsection on write concerns to my MongoDB Error-handling Notes. (no write-concern arguement) Writes to driver which must send potentially over wire to reach mongod. WriteConcern.SAFE Returns after operation known to have reached mongod. WriteConcern.JOURNAL_SAFE Returns after operation known to have reached mongod and written to its journal. WriteConcern.MAJORITY Like SAFE, but returns after operation has been written to a simple majority of nodes in the replica set. WriteConcern.FSYNC_SAFE Returns after operation has been written to the server data file. --takes a comparatively long time. to update the old entity with the “forgotten” flag. With respect to a replica set in Mongo, if the primary and/or other nodes are lost, you must have a "quorum" of voting nodes in order to elect a new primary and to retain full transactional status, i.e. : reading and writing. If you don't have a quorum, in many cases you can continue supporting reads, but no writes. A quorum (my terminology) is "at least 51% or more of the original number of nodes in the replica set". 10gen doesn't use this obvious word, but they should: in a voting body, a quorum is the smallest number of members that can make a decision in the absence of others. Also, a voting Mongo replica set quorum must consist of an odd number of members. So, if we start with a primary and four secondaries, that makes 5. Lose the primary and we have 4 left. That's an even number which doesn't work. We would need an arbiter too, to break the tie. I don't think arbiters count as members (for calculating quorums), but when voting, an arbiter does count as a member. So, an arbiter should be added, I think. Note: There is nothing wrong with arbiters; they're practically free being only mongods requiring virtually no disk and precious little memory. In a second case, if we started with a primary and three secondaries, that would make 4 total. Lose the primary and there are 3 voting members; I think that might be enough to elect a new primary. ...is done at the database level beginning in 2.2. Someday, it's slated to be more granular still, at the collection level. In MongoDB locks aren't really locks in the RDBMS sense, but more mutexes that a process takes while in a critical section of work being done. A lock isn't held across multiple documents (rows) as it would be in RDBMS; the duration of the lock is measured in microseconds. Coming from RDBMS, one shouldn't expect that locks will be a limiting factor in MongoDB because locks can be used tens of thousands of times per second for writes (and reads). 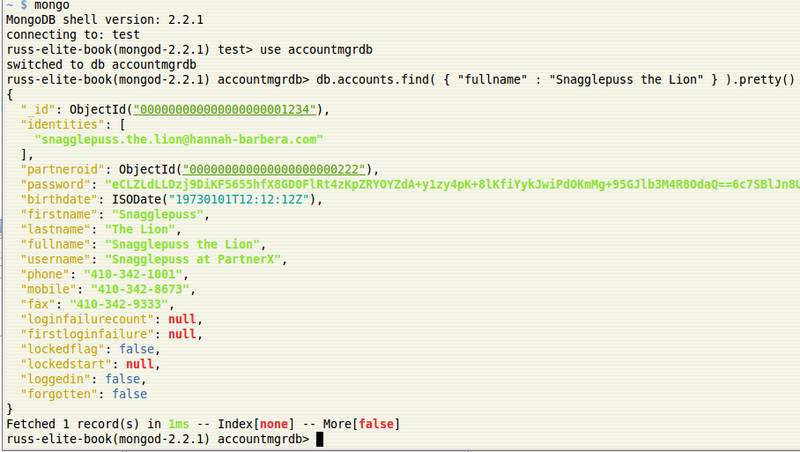 So, you shouldn't be surprised that someone came up with a very fun and useful way of injecting color into your MongoDB interactive shell session. Enter Tyler Brock who replaces the (for now at least) zero-length .mongorc.js file with his own. You do have to be running, at very oldest, MongoDB 2.2.x. Pick a subdirectory where you'd like to drop his stuff. You'll be updating it, if there's ever need, the same way you'd ever update sources controlled by Git. I put mine under ~/dev. Inconvenient to add new indices to existing collections, especially if big. Now possible to add it in the background. Auto-cancelation of operations by posting a maximum time in milliseconds for any operation, granular. Write commands delivered to the server (inserts, updates and deletes). All operations now deliverable in bulk, by some order, etc. Enables asynchronous communication with server. Power of 2 allocation enabled by default resulting easier predictability of storage requirements. Integrated text search. Beta in 2.4, released in 2.6 and integrated. New update operators $multiply, $min, $max. Now testable and extensible to add these whereas in the past it was very hard. Kerberos (2.4), LDAP (2.6), x.509 (2.6). User-defined roles for DBs and collections. Mixed-mode SSL. Obfuscation: Field-level redaction via aggregation framework. Trails can be written to separate file or system log. Can use S3 with control over deleting back copies, etc. And also automation from a web-based interface. That is, automating set-up of new databases. In other words, MongoDB's answer to Chef. Useful if you don't want to walk the Chef road.